J.D. Adams is pictured with the poster that described his research on a blinded hydration study. J.D. Adams graduated from the University of Arkansas a little over a year ago with a doctorate in kinesiology. He works as a post-doctoral fellow at the Mayo Clinic in Rochester, Minnesota, and last month he won two national awards for some of his research conducted at the U of A.
Adams received the 2018 GSSI-ACSM Sport Nutrition Award, which refers to the Gatorade Sport Science Institute and the American College of Sports Medicine, and the 2018 ACSM Nutrition Interest Group Award. 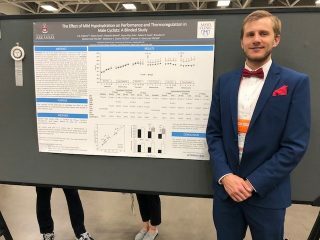 Both awards were based on Adams’ work on “The Effect of Mild Hypohydration on Performance and Thermoregulation in Male Cyclists: A Blinded Study,” which used data he collected while at the U of A.
Adams research shows that, in general, being well hydrated improves an athlete’s performance. But, he wanted to find out what happened if the test subjects did not know how much fluid they were taking in. He and his mentor, professor Stavros Kavouras, designed a study in which cyclists came to Exercise Science Research Center in the HPER building for two trials, one trial where the cyclists received an amount of fluid that matched the cyclists’ sweat losses, and the other trial receiving no fluid. Better yet, the fluid was infused intravenously, so the cyclists did not know which trial they were in. The year before, he conducted a similar study in which the cyclists received fluid through a nasogastric tube, again “blinding” them to the amount they received. In addition to submitting the abstract for his published research and his curriculum vita, Adams was required to give a two-minute presentation for the judges of the special interest group award competition. He received the awards at the American College of Sports Medicine’s annual meeting in Minneapolis. Adams’ research agenda moved from exercise performance to endocrinology when he took the Mayo Clinic post-doc position, which lasts another two years. He is now investigating the path from prediabetes to diabetes and looking at a gene that might affect insulin secretion and glucagon suppression following an oral glucose tolerance test. Adams said when he begins looking for research faculty positions, he may be able to bridge the two areas of diabetes and hydration together.